The old generation look down at the new generation kids with disdain. For them, the newbies are good-for-nothing. They have no responsibility, non punctual, no sense of direction, goalless, shallow minded and above all insensitive. So with this in mind, I was walking to work, when a mother was rushing her two kids, a son, 7 years old and daughter 5 years old. But what made me watch this trio was, the boy was walking bagless, while the daughter was carrying her own burden, who had difficulty in keeping pace with her mother. I really felt anger boiling against the mother, who was carrying the burden of the son. At that moment, I got the shock of my life, when the boy, slowly took the bag of his sister without her asking his help and without the knowledge of his mother. I felt so proud of him, a seven year old showing sensitivity, understanding, whatever. It was a jolting experience. You might want to know, why? I could be put myself in the category of older generation. During our time, this sensitivity of helping our siblings was forced upon us, but the newbies are given the freedom that they can behave as they deem fit. So this act of kindness towards ones own sibling, which is a rare trait, shows that attitudes have changed. Movies or not, cartoons or not, video games or not, there has come a good change from within which could transform the society as a whole. I know you might be thinking, how can one boy become the measure for the whole society. True, but if a mango has to ripe, it should start from some part of the fruit. If a seed has to become tree, it should begin with the first root and leaf, likewise, the boy could be the starting point. Anyway, I am crossing my fingers, so that this world of corruption, deceit, lies, etc... end quickly. In short, the world ends and a new world comes, where there would be no tears, corruption or hatred. A world where all are happy. Does it ring any bell? Exactly, the long awaited end of the world has already begun. For a new day and a new Earth. Don't think the world is going to end with water or meteors falling from the sky or earthquakes. All this would happen within us, we break the rock of the ego. Two days back, I met my cousin brother. So he was speaking about his work place. The atmosphere his higher ups create for the lower employees was the highlight. He said, how a new employee was treated when he made a mistake. The gentleman was warned, at that time another superior officer joined hands with this superior, saying, he did the dame before and the other superiors too joined. Its so humiliating to be working under such idiot supervisors. But I do not understand, how educated people could behave like that. I have heard, education refines man. Here I feel, it has refined the human heart and left intact the animal instincts for the rest of the society to tolerate. I have worked in different places and the attitude of the people are different at different circumstances. When they are far from home, out of state or country, people tend to be accommodating, understanding and helpful. No harassment or anything and these people when they come to their home town, they do not change. They are the same. But those people who have never gone outside their home town has less experience of the difficulties faced by a person. One should face problems, to understand others difficulties. That is when we become human. Hameed had to undergo a minor surgery and his best friend Danny came and spoke about every topic, except surgery. The surgery was successful. Years later, Danny had to undergo the same surgery, at that time, Hameed spoke about the surgery quite elaborately, etc.. preparing Danny to face the operation with courage and open eyes. Why did I say this story? Whatever we are, wherever we are and whoever we are, we do not stay as such, we will have to move on, we will have to grow. As we grow, our old space is taken up by our subordinates. During the time we are in that post, we train them for our post, by our behaviour, by our attitude to our work, to our colleagues. Our goodness should be passed to others and the best way to pass, is by being kind to our co workers. In real life, there is no differentiation between any two human being, as rich or poor, superior or subordinate, master or slave, black or white, etc..because we all are one in soul. When we die, all our education qualifications, job designations, riches, name and fame all are buried in 6 feet soil. The only thing that counts, is our goodness, our actioms, our attitudes, that we have done in our lifetime. If you have generously passed on goodness then you are lucky or else, start now or else, you will have to face all the bad actions you gave to others unto yourself. Are you ready for that? Today I happened to watch the world premiere of Ashiqui 2, a bollywood movie. Everything was good, the story line, the acting, direction, cinematography. I really was awed by the picturisation of the alcoholic. It was really superb. But in the end, it got broke, it got flopped. According to the thought process of an alcoholic, yes, he might commit suicide, but a movie maker, who, holds many a people's expectation, should have channelized the weakened attitude of the alcoholic to the path of victory . But unfortunately, he didn't. I was disappointed, because its marketing, was done ages before. So there might be lakhs of viewers, who might be an addict of something, which he is unable to break. So the chances of him committing suicide is more. Is it what we should wish of others? Its like escaping, running away from your faults. I believe in the strength of human mind, his will power. I will give an apt example, An Indian dancer, named Sudha Chandran, met with a road accident and one of her legs had to be amputated. Imagine, a dancer, without a leg. She was devastated? She could have gone into her own cocoon and wallowed in her grief. That is what we all do, isn't it? But she chose not to grieve for her lost limb. What she lost os lost forever, by grieving, she would not be able to bring it back. She fitted herself with an artificial limb, she practiced to walk, run and at last dance. Yes, she danced, until her wounded leg bled. There are people, who have no limbs at all, but still they live, they do all their work, without any help from others. Why is it like that? Because they choose it. And in the end, they achieve it. If you want something great to happen in your life, then choose that great thing in your heart and strive to get it. Have the patience, persistence, courage and faith in your self. Then it will happen. The alcoholic s in the alcoholic groups have chose to quit their addiction. Its a great step. But it shouldn't end there. Try to reach the finish line. I know, its not easy. But remember, we all have the power to make things happen, of whatever we wish for. So don't you ever think, you are incapable, or a loser. No, you are a winner, but you should choose it, that's all. Don’t take the drastic step of suicide because you will have to be born again and start all over again, from childhood to oldage, with a much much more difficult situation. So think twice before you act. It is your choice. Could you please explain the best sights of the place? That would be the first question any tourist would ask before he plans to go to any destination. Which includes both you and me. But this question was directed to me. That really was a question, isn't it? Usually we don't bother about the details of our own places. You know, the place I live is a tourist hot spot and I have not seen most of it. But I have visited several places out side our place. I really felt ashamed. Because I am a story weaver, when I say about a place, I try to give the story behind it, that's interesting isn't it? Yes I know because, along with my writing, I also organise tours. Just for a living. That is necessity. Do you know, before getting this job, I was planning to take up a job because my mom was very sick. So I was unable to return to my well paid job. So I set my conditions, of my job and I attended two interviews too. They were willing to have me, but some or he other conditions could not be fulfilled. So I declined to accept their offer. All were having second thoughts except me, because I knew, I would give my best, so I am entitled to all the perks of a good employee. I waited and after two days, my friend called me and asked, whether I am interested to take up a job, near my home. Just imagine, me walking to work? That was one of my requisites. And along with that all the other perks and much more were brought on my door step. So what does this mean? Have an idea what you want in life. If you are a spiritual person, then you do not have physical needs but for others, who have needs, don't just stand there and say, God will provide. You know, for whatever to happen, there is a correct time. We do not know that. But God knows. Sometimes, some good things could be denied due to our past bad behaviour, which blocks it to come to us and that might cause a delay in our smooth running of our lives. So, before taking a decision, let your soul, understand your need, in normal words, we say pray and have faith in your need and no matter what, believe that you will get it. Then, believe it or not, you would not only get all your wishes fulfilled but also some bonus gifts too will be added just for you to jump with glee. So next time, don't compromise on your requisites. But don't be a burden to your family. Its your resources, you will have to use and not your parents money. Its hard earned money, don't squander it to fulfill your wishes. And don't go behind easy money, that money is illegal, which means, the people working behind is snaring you to their web and ultimately you reach in jail, as they need some scape goats to cover up their shady business. So its your choice, whether you work hard and fulfill your own dreams or be a burden to the family and society and end up in jail. But if your wishes are a necessity to you, then, don't worry, you would never have to spend a single penny. Why? Because, that is how your soul works, which means, the soul sends the signals to God, which in the end would be fulfilled. You would get the power only if you prove yourself, in this world. What is there to prove, Rafael? That you can connect the physical you and the spiritual God. But, we won't be able to do it. Sorry Rafael, don't think, I'm stubborn. Its simply because, we don't even know the basics of getting connected with God other than pray and I have been doing that since I was a baby and until now, God is unseen and unknown to me. Thank you for being frank Ajay, prayer is indeed the first step to reach God, but there is one thing you should know, before you start the journey in connecting your self with God. Your actions and thoughts from the very birth, to the last breath of your life would be written clearly in your spiritual body. Do you mean to say that, whatever in my mind, like thoughts, hurts, hatreds, anger, everything would be written in our spirit? Yes children, everything, in the sense, everything, actions, words, dreams, aspirations, attitudes, etc..etc..
Why should it be written in our spirit Rafael? These writings are the main factors which decide, how fast we will get connected to God our creator. Shall I say a secret, a quick route to get connected to God? Keep your spirit clean of any writings, nothing, like no hatred, no dreams, no aspirations, no hurts, sadness. Only goodness in thoughts and actions. But that's impossible, only small babies and mentally ill or retarded people can keep their spirit clean. When a writing has already been done on your spirit by an action or thought, it will return to you, I'll give an example, you help your brother in his homework or told a truth, where you could have told a lie, all these would be written in your spirit and a circumstance would come later, when you really need a help and no one is there who knows you, but mark my word, a very big help from an unknown place from an unknown person, will be right there for you. When you are judged with lies, there would be a powerful truth awaiting you making you a hero. It all happens because of the goodness in what you had done and thought. So try to good, whenever circumstance allows you, it would be a deposit for future. I thought deposit are for money and gold. If you are in a plane, if a danger occurs in the sky, will this money help? When you are in a bus and someone robs you, what will you do, can you get back, what you lost? No, we can't, we can only complain to the police, that's all. Exactly, but if you have a deposit in your spirit, by doing good actions, then you will not have to face problems at all, no mishaps of any sort will occur and if any problems or mishaps occur, the angel in the form of person would be sent to you, to help you out. So, try to accumulate as much good actions and thought deposit, to your spiritual self as possible, O.K? No wonder, I saw this writing on a charity box, 'donation saves you from danger'. Now I understand why. “But how come, we do not know anything about it, Rafael? About, we as spirit, about doing good and it would return to you?" Actually, if I think about my life, I find, its a repetition of what I had in my younger life, a pampered life style, where I do not have to get into a bus or have to work hard and the worst part of all is, whatever I need has been provided for me, but unfortunately, not by me, but still my parents. For me, its humiliating. You know why? I earn, but it doesn't serves my purpose. What a waste? Then where does it go? That is the tragedy, to the needy, which is not me, according to my destiny. But can't I change it? Like I am able to use my money? I really do wish, to break this cycle, but how do we get to do it? I really don't know. But I am surely going to try finding it. If you guys have any ideas, be free to voice it. Since all things in nature works in the same way, in cycles, we have no choice, but to accept the fact that we cannot change. But I am not a person, who would like to sit idly and allow my destiny to take its course. I am going to fight this unfairness. You know for me, at least I have a roof above my head and a meal in my plate, where I can sleep without fear. But what about others? That is very unfair. Well put on your seat belts, we are going to go through the details of destiny. There are certain external circumstances, that breaks this cycle. Now, in the poles (North Pole and South Pole), do you think its out of the perview of our nature? No, you are just right. O. K. in the poles, there is a day, when it is completely a day and no night and there is a night which is completely night and no day. Don't think I have gone there, no, its all part of education. Now in the place we live, seasons change, that we have seen many times. But do you know, time changes, have you seen? No I have not. But the scientists have kept tag of it. So its a relief, isn't it to know, that this nature is not working in military specification. The next step, how do you put that special circumstance into our destiny. You know, our destiny is also connected to what we do of our given life? Well, that is where we are going to intervene. If you are presented with a new car, it lasts according to the way you keep it. Timely servicing and maintenance, no reckless driving, etc...etc... can help you last the vehicle a bit longer, but is that enough, we need something more like, our vehicle be up to date with technology. Would we be able to upgrade our vehicle? Yes, we can. Just like that, we have already created our destiny, but we are going to upgrade it, by sharing our abilities. Now, if you are a carpenter, you can give your best in work for your customers. It was long time back, to be frank many years back, when we bought our second home, my father was not alive and we kids were studying, at that time, our new home needed a renovation, to be specific, carpentry service. There was no one staying there at that time. So a carpenter was given the duty. We all know, without supervision, their service would be sub standard. But we had no choice, but to give free hand to the carpenter. We didn't hear him for two days and the third day evening, he came and asked for his payment and some extra money, for the purchase and he left. But after some months, we went to our new house and we found that the carpenter had not only done wood work but also some masonry and plumbing work too. I felt my eyes mist, you know, we were not expecting his work to be done properly, but he gave his best for a widow and her family. His work would be tagged and it woild be returned back to him manifold stronger. So that is how we will have to live. Give the best to the people around you, no show off please. It would not count. Well, now my money, I invested in the weak, the less educated, poor. They cannot pay for my services. And I am not expecting them too. But my services are not free. Its very very expensive and that would be paid, for sure, but how, well that you will have to wait and see. I knew from very young, my destiny was not good. But luckily, I had been given the opportunity to rectify it and I utilized it, to the maximum, helping others, whether family, friends or foes, if it is possible for me, I surely did it and I have never regretted it. Don't think about your destiny. If ever you get an opportunity to help, don't throw it away because that is the way of the Supreme God to give the special circumstance to change your destiny. Today I was thanking God, from the very bottom of my heart, that a drop of tear or two escaped my eyes. That's the miracle, the beauty of life, the beauty of being human. You would feel it, when you stand in my place. If I may be frank, you might even howl your eyes out. That much big a miracle has happened to me. Now the miracle, I had written three books. I love all three, two are published, one is a romantic, " Follow The Heart & Time Your Tide " and the second is for children as well as for elders. 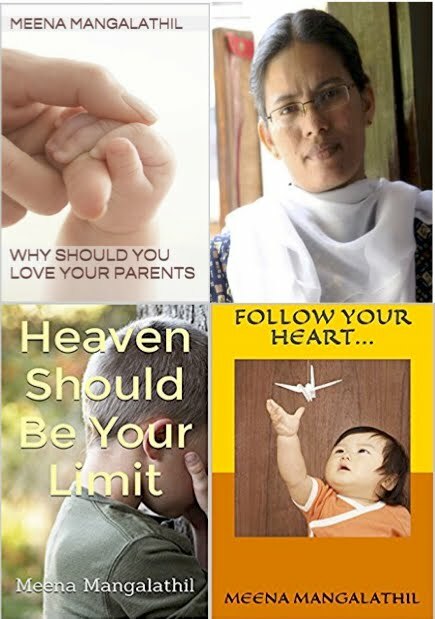 The name, " Why Should You Love Your Parents ".The third is a family book, I have not named it. But I would surely do it. But there is one important necessity for every book, beauty, it should blend into the hearts, that work is done by the editor. I am a writer, but not an editor. Since I am not famous as a writer, I did not know whom to ask. So the best option with me was, ask God for the right person. I did. It was ages ago. Since there wasn't anybody coming, I did the necessary corrections and published. I got a new job quite accidentally near to my home, just walking distance. I joined and my colleague, Nisha, a very powerful lady, very much straight forward, helped me understand the nuances of the job. Day before yesterday, when we were free, I showed my ebook, she read the first page, immediately she asked, who edited it? Then I showed my blog, there too she said the same. I asked her, would you be able to edit my works? I waited with bated breath. She replied, 'Yes' with a broad smile. You know, at that very moment, I with my heart just flew off to say thank you to God. At that time, that single yes, was the best gift a human could give to another. That is what we call a miracle. I didn't have to search, call or enquire for an editor. She was gifted to me, on a silver platter. So today, when I went to meet God, I naturally had to thank Him, right? The only difference was, it came from the very bottom of my heart. Now, I would have left it out like that, but in connection to this incident, I happened to watch a Hindi movie, "My Name is Khan". In that movie, there is a part where the hero wishes to meet the president of America. Its not possible, unless you are famous. As he travels to meet the president, he goes through several hurdles, which we feel unfair. But in the end, he gets to meet he president in a grand way. This grand way happened because, the hero went through so much hurdles, he was patient while facing the storm. He didn't run away. He invested his complete self to the people around in whatever situation he was put and thus ended in this grand finale. Seeing this picture I felt, hurdles are not happening because we are making mistakes, its because we are in the right track. We are being prepared for the grand surprise. Live your life and be happy. Sorry, yesterday, I wasn't able to talk much, as sleep was trying to overcome me, I had only one thought, bed. But there is one thing, which I don't understand, why we should sleep? Yeah, I know, good for health, etc..But why should nature create such a state for all its living creation on this Earth? Have you wondered it? Actually, in the Bible, I have not seen a literal sleeping of Jesus, well there is, this sleeping in the boat part, but other than that, nothing, saying slept at night. But why is it like that? Is it not very important? Hmm.. actually, we will have to think about it. Sleep, hmmmm. I love it. And I feel, you people too like it, don't you? Do you know why? Because we are dead to the world for some time, that means, we get a chance to forget our sorrows, hurts, losses, whatever bad we are facing will be dead for sometime. But, do you know its not healthy? To cover our problems in sleep? Do you know problems are good for us? No.. seriously, I am not kidding. Its true. You know, the most pure gold gets more price. And hoe do we purify gold? By melting it. Do you think, it would be easy a path for the gold? I don't think so. But once it has gone through that melting part, it is finished. Likewise, in our lives, problems help us get purified, to make us priceless. You know that purifying part is usually done, when we are free, after our commitments are fulfilled. It is that time, when we think, when the mind clashes with our soul. After the big battle, actually, have you heard of Mahabharath, where a war wages with the Pandavas and Kauravas, that is this war, the war of the mind and soul. In order to overcome evil, we will have to get the help from power above, then we come to a state, where, we forgive, those who have hurt us, humiliated us. Then we get to sleep our physical body day by day. So that we can stop a second birth to this world, with all the problems, we had covered with sleep and start all over again. So better face your problem buddy. I for one would not want a repeat performance of this life, that's a sure bet. hunger, hurt, anger, happiness, elation, dresses, money, what all things we need to look or go through every day. No kidding baba. I am no game. Sorry. Can I pass a secret? I don't waste time, thinking of all the people who hurt me. You know, my policy is, you reap, what you sowed, which means, if not in this life, I might have done, a lot of mistakes in my previous lives. So I am entitled to whatever hurts and humiliations I get. So then, are there anyone to blame for my situation? None, just me. So, the problems, I have to take it head on, then and there. Do you think I have any choice in the matter? No. So, I do not have to carry any baggages for the night. At least, I can sleep, right? Until then take care, Bye . Yesterday, I spoke about changing my destiny. But there is one thing you would like to know, when will the destiny be changed? That is the beautiful part. Have you heard about the right time at the right place with the right person? That is when it happens. I will give an apt example. Years back, while I got enrolled in college. It was in another state, far off from my home. My cousin brother was there with his family. So I asked him to help me get to my college. It was a time, when only land phones existed. So he promised to be in the railway station and I went alone to that destination. I had a two day journey to reach there. Expecting my bother at the station I got off the train, to my utter shock, there was no one waiting for me.I didn't know the place, this was my first visit. I didn't know how to reach their home. But after seven hours travel I reached them, all were shell shocked, except for my brother, who had not yet returned from the railway station. You might think, why all were shell shocked. The first question they asked me was, "Meena, do you know how lucky you are? If someone had given you a wrong information, you could have ended in a red street." Wow!!! Just imagine me in a red street and not in my brother's street? That is how we change destiny. My brother thought of picking me up from the station before the planned station. Since I didn't know of this plan, I missed him. It was pure God's grace, that I reached home unharmed. So now you know you can change destiny, just do good and have a bit of patience, to receive the returns of the good deeds you have done. I for one has no more patience than a butterfly. But I know there is no use rushing because we have a long life to live, whether it is for a day or a life time. One thing I am really working out, how to stop my rebirth. (All my past lives bad deeds are really making me crazy) Don't ask me. I don't know. But hope to find out soon. There is one thing I forgot to say, I was saying about my life's miracles, talents which I loved to have and fears, which was transformed to give me an identity. Which means, all human race have this. Even nature too have it. You are a bit skeptical about nature, right? Well I will explain. One of my friend's father was a pearl diver. I was simply awed by the profession. It was during this time that we had a lesson about oysters. Do you know the specialty of oysters? Its just like you and me, simple living being. And in its system, there is no option of producing pearls like apples and oranges from trees. Then how did it produce pearls? A small grain of sand. You know that oyster has no legs, its just a piece of meet and we see it in water. So while moving, if a small grain of sand enters into its shell, it has no way to take it off, but it is not comfortable with a grain of sand. So it starts producing some hormones and covers the grain of sand and it continues this process, until it becomes large enough to push it, so as it rolls off from its body and relieve itself from discomfort. But, sadly, the oyster doesn't know, the thing that rolled out from its body is priceless, the more the time it takes to form the pearl, the higher the price. So this is an example from nature to show that, there are lots of things we are uncomfortable. Don't just hate your self for that, try to transform that uneanted element to the most precious element of you. Sometimes, your unwanted trait might be your asset. O.K. So you might be womdering what miracles happened in my life. Well, don't get too surprised, you can call me a miracle child, oops.. sorry, woman. Do you know that I didn't have a voice to sing. Even now, the voice is same, if I have to sing an octave, I'll have to unseat myself to get that stage, you know, raise from myself up with my sound. No, its no joke. But the sad part is, I love music. I love to sing, anyway I can praise myself, that I do perform well, when in bathroom, that's a commendable achievement, right? Hmmmm. But I didn't want to stop myself there. But where do I start? As far as my resources goes, it starts in the boarding and end in the boarding. So if ever I want to learn a song, who has no talent, then forget the thought. But that is when miracle happened. You know in boardings, everyone are made to sing, whether you liked it or not. Since, I loved it, I gave my best shot. I was selected to sing for the church choir, its shocking, right? Well, it was not only for me but for the real singers too -A very big shock. How come, I got a chance? I didn't know. This happened when I was twelve years old. All the other members were seniors. Since I was the youngest, I had to stand in front, near the pianist, who was unfortunately, my boarding mistress, eeeeee. It was indeed scaring and the funny part is, I had to lead the song. Just imagine, a non entity leading a group of lead singers. Do you think they would accept hands down? You guessed it right, a big No. And the taunts started, they started openly criticizing and all my friends became enemies. So for the next practice session, I took the very back seat, so that no one noticed, there was a person, named Meena. But after many takes, the boarding mistress, started her firing session. All sat quite, you know, its better to stay low, when you are at the receiving end. Since, I was not planning to be in the choir, I didn't even learn the song. I waited for the sister to continue. So that, I am able to relieve myself from singing, but then, some miracles have to over stay their welcome, whether we wish it or not. After that stillness, the question boomed, "Where is Meena? " I really fainted out of fright. Imagine, me being called by my name? I went to the front. "Start the song "
My heart literally stopped, how am I to sing? She knew I was goofing around. She gave nice thrashing on my hand and continued, "If there is a song, stand beside me. I hicupped and nodded. You might wonder why. I too didn't know then, but at least the children accepted me as an integral part of the song because I had sense of music, even if anyone makes a mistake, I won't. It's incredible, right? That is the beauty of doing what we do with hard work, a lot of love and a beautiful miracle. I competed and won many prizes, with a booming sound and a sense of music. So take time for God, He would not deny anything, that doesn't mean He obliges everything, eh? Basically my upbringing was of a spiritual trend than the normal live and jive. Don't think it was purposely done. When a lady is given a convent education, then prayer is a part and parcel of the education, along with all the disciplinary life style. Waking up at 5.30 in the morning and go to church for the mass at 6 was not a very happy ritual then. But rules are always rules, when you are living under their supervision. I have always thought, why prayer. It was so boring. I literally slept through mass, my whole of my growing stage till high school, after that I became seniors, which would not be a good practice. For the outside world, we go to church, pray morning, afternoon, evening. So we should naturally be God's pet. But is it true, that by always praying and going to church or temple or mosque can get you into the good books of God? Well, I can surely say, No. My son, he is averse to long prayers. But his grandma has a long list of prayer, which would naturally be good for the family. As a respect to my mother, I do not deny any of her wishes concerning prayer. But I really do feel sad, as she doses off between prayer and my son, during this sleep break speeds off this prayer session. Do you know, when we are praying, God is with us? looking at us with a smile? very happy to hear what we have to say to Him? Imagine the shock, he would have, when we insult Him by dosing off or speeding, so that it is completed before the movie starts or to fulfill thousand other things. Remember God is the creator, not someone like us. You might not have time, good, but if you are planning to pray, give your self whole heartedly to prayer, to be with God. Either pray or don't pray. Don’t insult God. He is your creator and not the other way. Give time for God and see the miracle because He is always waiting to answer your prayer, whatever it may be. I take this opportunity to beg forgiveness to God for unknowingly insulting Him through prayer. I try my level best to make my family understand the mistake, but you know, family. Only a spiritual guru can make them understand. So let them learn by trial and error. Can I add one more thing? I feel it might be these continuous prayers in school lead God to intervene at every turn of my life and the miracles happened is simply mind blowing. So prayer is very important in life. Four days back I became both deaf and dumb for 12 hours. Actually, the doctor gave me the privilege to be deaf. I do not know, how it happened, but one fine evening my both ears got infected and it was very painful to even touch my ears. Don't ask me how because, this is the first time, I had the opportunity to have an appointment with an ENT. Anyway, the said doctor was very knowledgeable about my disease, he immediately squeezed half a tube of medicine, into my ear and started closing it with gauze tightly and covered it with cotton, the same he did for the other ear too, luckily he had told me before closing the ear, the other procedures to follow after returning home. After packing my ear, I have never seen a mpre silent hospital, the place had thousands of out patients, but it was pin drop silence. I was completely shut down from the world, when I murmur, the sound vibrated inside me. I couldn't hear any noise. It was so good. I didn't have to be alert or bother about any phone calls, added to that I had high temperature. So it was perfect. I reached home, my family spoke to me, questioned me and I didn't have to answer, because I couldn't hear them. The tantrums of my kids or my family members were all lost, there was actually no tension, no expectation, no planning. It was a beautiful world in me. After 12 hours, the pack was removed from my ears. At that moment, the noise, the questions, the air, the sounds made me feel, that I was ripped off my cocoon. Only then I knew, how lucky the deaf and dumb are. They actually not missing anything, but we are the real losers. They are enjoying life and we struggling, each moment of our day to survive. It's sad to say, that its simply scaring, this world of noise and sound. I was womdering, whether we have any congregation, who shuts their ears from the outside world, like there are convents and monastries, who abstain from talking. But I suggest, the easiest method to stop talking or stop getting angry, is by closing the ear and become deaf to the world. Its always a good practice to close ears at least 2 hours daily. So that we know our inner silence, the power of being silent, how much waste words and sentences, we are using daily. And above all, you would get an awareness of the real you inside. Do you have the courage to check? Continuing Yesterday's venture , of returning to the womb. We have to take several steps. I will give an example, my own example. It was when I was small. I was a joker, which means, I would crack jokes and make everybody laugh and sometimes, it included lies too. But as I grew older, I do not know, how I outgrew out of it, but I didn't feel anything funny about these jokes. I completely stopped it. But the sad part was, the lies returned to me amd was repaid in the same coin. Since I hadn't done much damage with lie jokes, I had to bear only a few but the consequences of it extended my whole life. I had to live with people who only lied or averse to truth. I was shocked. How did this happen? Then I knew, my destimy was conmected to lies. Either, I totally abstain from lies and reach my destination without casualty or churn around this mess of lies I have already created and go on creatimg more of it. You might think, lies is O.K. But believe me, its better to die than to lie. I ask my students, family members, friends, to consciously abstain from lies. Imagine, you have not done any wrong, but if our loved one lies against us, how would you feel? Its not a happy situation, isn't it. But if it doesn't stop there and become a chain reaction from all corners of our life, how do you feel and that too life long? That is what I am saying. What has been done cannot be undone, but you have this moment onwards, try to be truthful. If a circumstance arise and you cannot speak the truth, then just shut your mouth and avoid the consequence. So please please do not lie. I had abstained from lying simce class seven that is when I was twelve years. It is not very easy. Sometimes, truth is weirder than fiction, no one would believe us. But I say its worth it. You become an ascetic. You would not have anyone to blame because God would give the wisdom to you and you would know, whatever bad is happening, its because of your own action. " Now when we are facing global warming , whom are we blaming? Because we know, we cut forests without care , we used carelessly water, soil, minerals, etc... Polluted all our resources, resulting in this critical situation. So now, all are striving together to save nature, that means we are all trying to rectify our past mistakes. Likewise, we have already lied a lot. If you have not lied, then its O.K. But for the rest of the liars, please beware, you would never be able to face the consequences, unless you stop it. So the first step towards the journey to the womb and not to the tomb is, Don't Lie. I think that would be enough for today. Now, imagine we have thrown away anger, we are without anger, no one can make you angry, Hurrah!!!!!! Hip.. hip.. Hurrah! !!! It's cool, isn't it? Hmmmm.,... it is, but we have a long long way to go. We should break the barrier of religion. You might ask why? I am not saying, you should unfollow any religion. I am requesting you to take the good of all religion. Look at the world around, do you eat only traditional food? Have you ever tasted food other than your countries? The Chinese, the Indian, the french, Italian, American, the whole world habe different traditiomal meal, do you think, by eating other country's food, it would be treason. If so, then it's no use reading this blog. Look at the plants, we graft, we bud, we do genetic engineering to the seeds, why? Because we feel, the original seed cannot produce the desired result, so we take the good qualities from other seeds and merge into the one we have, do you know what that means, our seed is good, but there is something missing, our religion is right, but in order to gain ultimate fulfillment, we will have to take the initiative, that all mankind is one and no religion is there in the eyes of God. Just because, I am a Himdu, Muslim, Christian or Budhist or whatever, I do not get special preference. I have to earn my privileges. Even if I am a Pope or a Dalsi Lama, I cannot get my privileges, So, I request you guys, break the barrier of religion and embrace mankind as your own family, as brothers, sisters, grampa, gramma and love them as they are, that is the second most important thing you should learn to do. Am I asking too much? For me, it is a big yes, I feel it would take some time. So how much time do you need, to accept the world as one family? A week, a month, a year or a lifetime? Don’t answer, if you are willing, you can accept within a moment, if you are undecided it crosses lives. Unless and until you accept it, you would never find God, even if Jesus shows the way. In this Universe, there is only one religion and that should be yours, mine and for all the people of the world. You all know it, but you have shut your heart against it. But I will have to say it and the choice to follow it is yours.The religion os Love, as in Love your neighbour as your self, love your parents, love poor, love the sick, when someone slaps on one cheek show the other, when someome asks for your coat, give your shirt, etc....its all love, the whole of Holy books is full of love. Have you that in you? Hey guys, was I serious? Then its O.K , because its serious business, out here. Yesterday, I told not to be angry, right, bit I missed on one thing, don't think you are solely to blame for anger, people are there for sure, but for those people, you should have the courage to forgive. While I am saying this, I was thinking of the trial, persecution and crucifixion of Jesus. Why was He brought to trial and all the atrocities he had to take. Do you know? Or I will ask differently, did he do any wrong to get a death sentence? We all know, he was innocent, when Pontious Pilate washed his hands off innocent blood. Anyway, we are not going into the reason, but we are going into the attitude of Jesus, the disciple Judas betrayal, all the disciples fleeing away from him, when He needed them most, disciple Peter, denying Jesus, all the people, who saw his miracles, who might have been the recepients of his healing touch or some of His miracle too shouted 'crucify him'. How might have Jesus felt, but He didn't utter a word and before death, He asked God to forgive all the people who hurt Him, saying, they do not know, what they are doing. Its the truth, if we know the enormity of our wrong, thoughts, words and acts, will we do it? I won't for sure. And I know, you too would do the same. But if all these atrocities were on us, we would have killed an extra two and abused the lot. But that should not happen in our daily life crucifixion. Accept it silently, whatever hell we raise, it would not be heard, but if we just bear it and shut our bloody mouth, the only thing we can do is really forgive them. I know, its not easy, but, give it a try, you would feel wonderful and different. That is when we resurrect. Hii I just covered three religion because, they have more followers, bit that doesn't mean that the other religions are less prominent. Now, we go the next step. How do we get into the act of finding God. I told it is through Jesus. That is also fine, but, still, there are lots of details, which we have to cover and the first thing is you. You have to do lots of pruning to do, which means, clearing all the unwanted things of you. First and foremost, control your urges. The first urge is anger. You know, now a days all are angry. I do not know why? But that one urge should be completely out. Can you do it? I know, its not easy because I have a hard time controlling mine. But do try, it would make a lot of difference. Don't swalow anger, that's not the way to do it. Look at the source of anger in another perspective. Find out, why an act , makes you angry, if you can find its root cause, which is in you, then you are lucky. Because, anger is created for you to block you in reaching God. You know when Jesus was taken by the soldiers after betrayal, one of his disciples cut he ear of the high priest's servant. Do you remember, what Jesus did? He spoke strongly, saying, those who take the sword, will end under a sword. So you know, how much important it is to remove anger. No one can make you angry, only you can create it, that is the first thing, you should note. So don't blame anyone for that, O.K. Now analyze it. Don't think I have left out the religion of Muslims. Do you know the specialty of this religion? Do you know, in christians, the first commandment God gave to Moses is somewhat in that line. Which means, that it is a very important, factor on the facet of findng God. Now the question is, which idol does it signifies, do you know? God didn't mean the idols we make with clay and keep it in chirches or temples. Its the idols we keep it in our heart, that God hates. If I was your lover and if you think of someone else instead of me, be known, you are out of my heart and my life the very next moment. I know it would be the same for you too. Now we have several obsessions, like be coming rich, famous, having a car or whatever, these idols are what we should forefeit, that's what Muslims highlight through their religion, that we all should incorporate in keeping our relatiomship intact with God. I hope you understood what I am meaning. All religioms are true, don't think that only one religion is true because, we all are one in soul. Hiiii I know, I have gone a bit weird, when I told that there is a way to reach God. But its true. We have it, the religion of christianity shows it, through Jesus. No I'm not joking, Jesus is the way, truth and light. When you read the Bible, there are so many meanings, which is too complicating. But I'm not going into that part. We just need to know the way to God. Its through Jesus. Naina is a software engineer, she has family, good job, name, fame, whatever one can dream is all there. She was happy and contented. But one day, one of her software she created to one of the famous companies crashed the whole system, all their entry got lost. She couldn't rectify the problem. She lost her job. Her family ridiculed her. There was no one for her to share her sorrows. She was totally alone. The society laughed at her, they whispered behind her. She was humiliated and ridiculed, by one and all. Then she knew, the name, fame, money, job, family can go with a blink of an eye. She sighed, no one was there at her left or right, so she looked up to heaven for help. And the help came in the form of a young software student, Sunny. He was an ardent fan of Naina, So he checked her program and found the root cause, a small word, inserted in one of the lines. He removed it and the software worked properly, retrieving all the lost data too. Then it was found that her rival had done this, to destroy her. He was jailed and Naina was reinstated into the job, with a better salary, but she was a changed person, because she went through the cross, the path Jesus showed. Here, Naina went the way of the cross, she was stripped of her ego, humiliated, rebuked, ridiculed, it was like lashing and crowning with thorns, when her family too insulted it was the final nail on the cross. This brought a realization, what we have in this world is temporary, we have to be with God to be permanently happy. That is when she resurrected, God sent His angel through Sunny and help remove the block and lo behold, Naina was resurrected from the temoorary happiness to eternal bliss. We go through several of these types of incidents in our daily life, you go through it patiently because we cannot reach God, without having the full knowledge that we are not living for this world. And the world would strip you with such ferocity, that you would be aghast, when you see the change from the very eyes, you thought were your loved ones, don't worry, just like Jesus' last prayer, 'Forgive them Father, They do not know what they are doing'. The sad part is, Jesus showed it in the maximum magnitude omce, but we habe to go through this cross several times a day till he ery end of our life. Best of luck guys and for me too. I hope I was able to give some idea about God. And I also ensured that only by uniting theouhh him can you have life energy. Now you might want to know, why do we need life energy. Man has a history of decades of years. Can I ask a question? According to the advancement of technology, which age is livable or tolerable? Paleolithic? Mesolithic? Neolithic? Sorry, I do not the name of this age or is this age? Well the answer would be truly his age, but I differ on that. Look at the egyptian pyramids. When was it built, well, I'm not so sure well nearly, 2500 B. C. Look at ots perfection, even now, with all these technologies, we are not able reproduce it, why. Simple because we have no life energy. Every civilization has some or the other forms of uniqueness, the Romans, the indus or the indians, americans, everyone has so much to boaat of, whoch we canot reproduce, so we are forced to preserve, or conserve it. Its all necause, the people at that time had more life energy, than we have now. Where did we go wrong? Or what have we missed? I know, its not easy to explain God. If I ask you explain nature, would you be able to do it? You might, but you would not be able to do justice to the real nature, that much multifaceted is our nature, then just imagine, how would we be able to explain its creator. In india, though we have all religions, Hinduism, is the major religion followed. The specialty of this religion is they have more than three hundred million Gods. You might be thinking, how can that be possible. Well, believe it, its there and I would not negate it too because what they say is true. I'm not joking, eh. The saints and hermits, who follow Hinduism, was in fact, pointing out the different facets of one God. They have Sri Ram, who is a just King, Goddess Lakshmi, the goddess of prosperity, Lord Ganesh, who clears all obstacles, etc...which means, they simplified God for the simple hearted people, but, we on our small thought, misunderstood. So imagine God with more than 303 million qualities. Now, He is the source of energy, we all have receptors in our souls, to receive energy from God and that energy helps us to become complete, happy and above all fills us with love. That is when we overcome death. We would live eternally and happily ever after. How do you feel? great? Anyway try to muster some life energy or else, your life would be wasted.